Since it’s an amphibian, it does live in water and on land. The eggs are laid in water in late fall or winter, and the larvae hatch and mature through winter and early spring. This is what young mole salamanders look like: striped yellow or tan and brown, with big feathery gills. And here’s the awesome thing about these little guys: when they grow up, they can keep their gills and stay in their nice familiar pond as adults. Or they can lose them and venture out onto land to become air-breathing terrestrial adults. I’ve only found the gilled adults in deeper ponds, but that may be because those ponds are the only ones that have enough water year-round for them to survive. 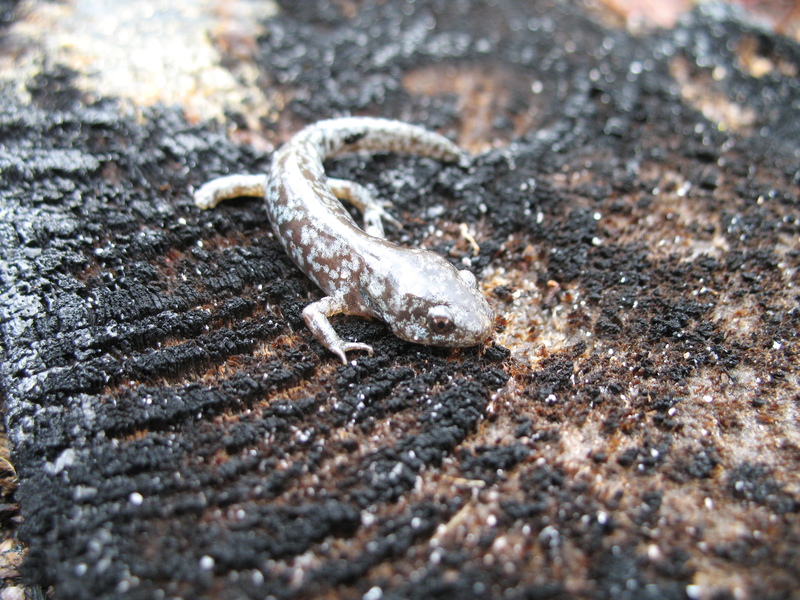 This tendency to keep juvenile features into adulthood is called neoteny, and it is fairly common in salamanders. 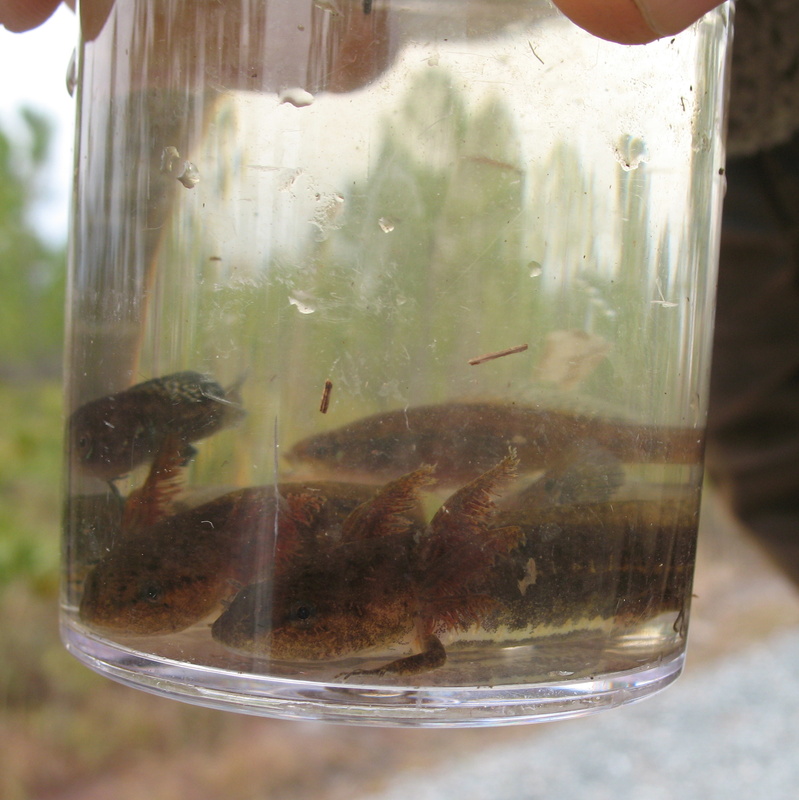 These nearly-adult salamanders from a deep pond seem quite happy to keep their gills. Though less happy about being trapped in a jar and photographed. Aquatic sub-adult mole salamanders with gills. The mole salamander has a more famous relative you might have heard of: the axolotl, a large salamander native to Mexico City. The axolotl is even more neotenous. It almost always keeps its gills as an adult. 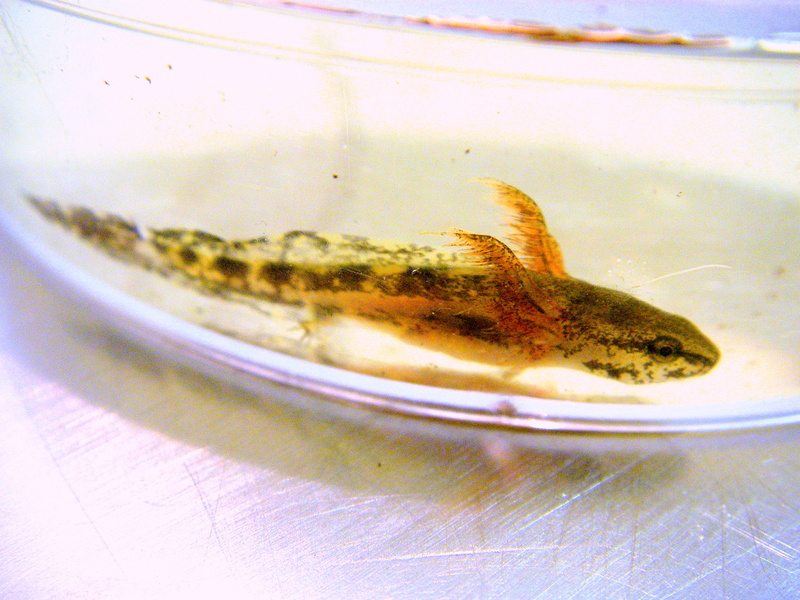 Axolotls can metamorphose, if they get enough iodine, but they usually don’t. Unfortunately, they are nearly extinct in the wild because the lakes they inhabited are almost gone. But they are commonly bred in captivity and kept as pets. Even if I wasn’t looking for them, it was nice to find them. And look how cooperative they are for the camera! This might give me a few nightmares! I have heard about Axolotl. Though I don’t know what “neotenous” mean. Could you please tell me? Sorry, “neotenous” describes a species that keeps juvenile features as an adult. Humans are actually one of them! If you look at other primates, you’ll notice that their faces are much flatter when young, then grow longer as the ape matures. Humans never grow “adult primate” faces. Oh. I doubt I understand yet. Human faces do grow and change in shape as they become adult right? They do a little bit, but the difference is much less pronounced. Very interesting and informative blog. I have a few friends where I live who observe the bird life and keep records. Frogs are rare these days and newts are an endangered species right now. How is the wildlife coping where you are? Frogs seem to be doing okay in my region, although there are concerns about chytrid fungus. I’d say the bats are in the most trouble right now; there’s a disease called White Nose that is killing huge numbers of them, and there isn’t much that can be done about it so far. Thank you! And “appreciate little things you may not have taken notice of” is exactly what I’m going for, so, yay! Wow. Very informative post, and blog, I reckon. I am quite interested in aqualife (I don’t know if that’s a valid term), and was into fish-keeping for quite a few years, and plan to start again in future. 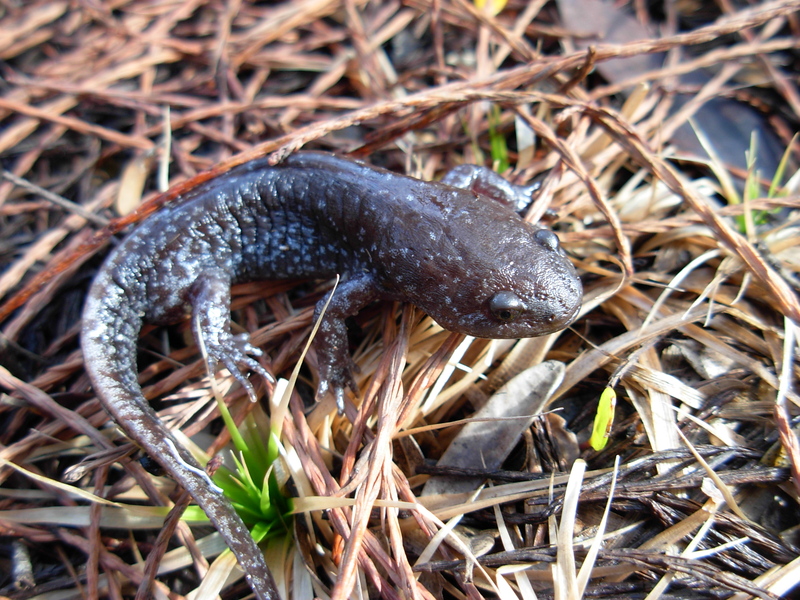 Loved learning about the mole salamander! Thank you! I confess, there is a great big hole in my biological knowledge where fish should be. But saltwater aquariums seem like such a fascinating (and satisfyingly geeky) hobby. One day I might try it. I just woke up one morning and went to feed the fish and oh my, the water was filled with hundreds of tiny translucent fish-kids!